I love spices... probably too much. I have a whole drawer full of spice jars and another shelf of random spices. I came across this recipe for Pastrami-Style Salmon and thought the spice mix was rather interesting. Since I didn't have any salmon on hand, I did have some ground turkey to use for dinner. Combining the pastrami spice mixture and ground turkey was truly an experiment that turned out to be delicious! I decided to use this spiced ground turkey and stuffed some large portabello mushrooms and voila... dinner is served. I accompanied my stuff mushrooms with roasted asparagus and tomatoes. What a great entry, Joelen, thanks for participating! And I always love roasted asparagus. You and your husband certainly eat like royalty thanks to your culinary adventures! What a great idea! Sort of like a turkey burger and a portabella burger all in one, and a great low carb meal too. I'll have to play around with this one! I'm going to have to try this. Even better b/c it's dinner for 2.
wow you took ground turkey and made it gourmet. Sounds sooo good. I will be trying it out soon. This looks wonderful! I love the combination of flavors you used. Making ahead is a good idea - there is plenty of room in the deep freeze downstairs. What is the difference in dark & light brown sugar? This looks so tempting Joelen! I'll have to remember the pastrami spice mixture the next time I buy ground turkey. That is a really creative combination of spices. I think your choice to pair it with the turkey was great, seems like a more perfect match. I always drool when I think of stuffed mushroom! Too bad we don't have portabello here. What a beautiful, COLORFUL blog! I just clicked over from Leftover Queen's. So glad to have been able to discover you! Sounds like a really good spice mix you got there. I already know I'm going to like this. 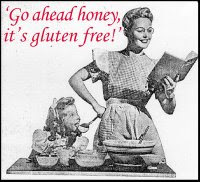 Thank you for such a beautiful entry in the Go Ahead, Honey, It's Gluten Free Seasonal Vegetables event. I have just posted the roundup.